You’re about to sell a high value item to a customer. There’s a lot of risk involved. Not only the potential for a charge-back and the value of the item, but your reputation as well. 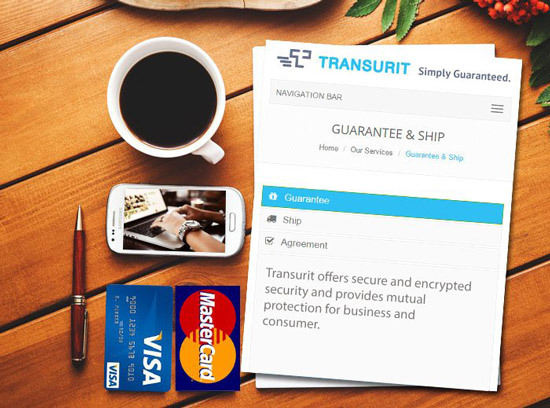 With Transurit, you can have the peace of mind knowing that your valuables are guaranteed and secure, whether it’s just across town or across the globe. Our proprietary transaction purchase program and mitigation tools reduce the risk of loss and theft, in addition a variety of our tools streamline the overall transaction process. CHARGE-GUARD® Protects against unauthorized charges, charge-backs and stolen credit cards. Up to $10,000 International coverage. PayPal basic coverage up to $10,000 domestic and $5,000 international. SMART-SHIP® Is designed to help verify an individual's identity, by analyzing data elements including: email address, IP address, social media records, lifestyle indicators such as residential moves, previous product returns and/or purchase habits and other pertinent elements. SMART-SHIP® will also give you a visual view of the "ship to" address. With the click of a button our system searches 5 billion records, scrubbing buyers data and all available personal information against our anti-fraud algorithm. SMART-SHIP® is designed to help verify an individual's identity, by analyzing all data elements including reputation, email address, IP address and other points of reference. CHARGE-GUARD® protects against unauthorized charges, charge-backs and stolen credit cards. Up to $10K International. PayPal coverage up to $10K domestic and $5K international. EMAILIFY CHECK allows you to verify the reputation of an individual through analyzing their unique email address In less than 30 seconds. * All protections are subject to the terms and limitations in the service agreement. Each year online fraud increases by 6% or more. The Transurit platform is designed to assist you with all your risk management needs. This platform has deployed the latest risk assessment tools lowering your risk.